The 11th annual Billboard Women in Music event took place in New York City on Dec. 9 and concluded with their top honor of Woman of the Year. The 2016 recipient was granted to seven-time Grammy winner and icon, Madonna. 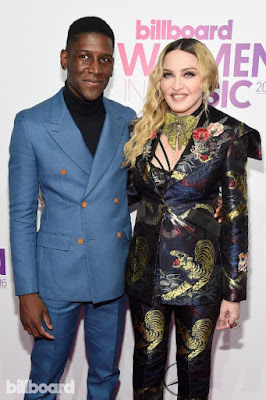 In recognition of this award, the "Queen of Pop" herself invited British artist Labrinth to perform an emotional tribute that included "Frozen" and "Like A Prayer," which led into her acceptance of the prize. The event will air nationally on Lifetime on Dec. 12. "I heard the song 'Jealous' and it blew me away. Not just for the lyrics, but also for Labrinth's intensity and charisma as a singer, and his authenticity as a musician," Madonna said. "It's been awhile since I have been this excited about a new artist." While Labrinth is currently working on his second studio album to be released in 2017, he is featured on Noah Cyrus' newly-released debut single "Make Me (Cry)" which he co-wrote and produced. The track has received unanimous praise and immediately became the number one shared song in the world on Spotify, climbing to #1 on Spotify's Global Viral Chart. Labrinth emerged as a guest artist on British rapper Tinie Tempah's debut single, "Pass Out" - which he also produced and co-wrote - and he instantaneously became a mainstay on the UK charts. Following a string of chart-toppers, Labrinth emerged as one of the most sought-after writers and producers in the UK. Ultimately, his song "Beneath Your Beautiful" featuring Emeli Sandé, peaked at number one and crossed over into the U.S. to become Labrinth's first top 40 hit on the Billboard Hot 100. He followed with the heart-breaking "Jealous," an intoxicating ballad that further cemented Labrinth within the artist community, and lead him to collaborate in the studio with the likes of Ed Sheeran and The Weeknd.